Here's a beauty of an overgrown terrarium, which lives at Sightglass Coffee in San Francisco. 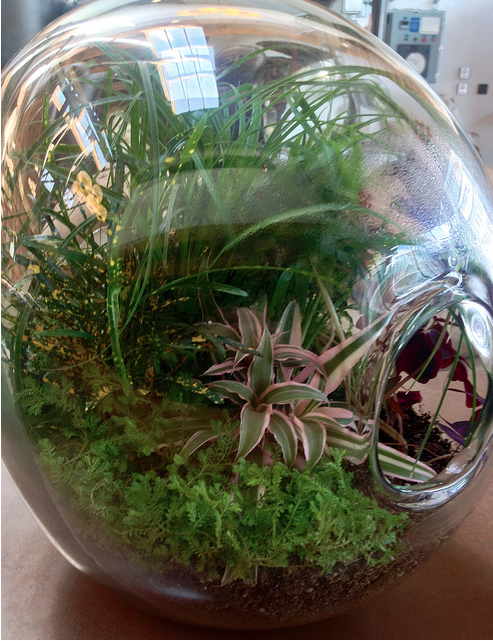 I spot some spike moss (selaginella) in there- a hardy terrarium plant that I highly recommend. The variegated pink plant looks like a spider plant of some sort; anyone know what it is? It's Cryptanthus, a small terrestrial bromeliad! They're great for terrariums.